I appreciate Drs. Jesus Vincente Carbajosa and Joaquin Medina for their kindness to take me to the locality of Drosophyllum. The genus Drosophyllum is monotypic and is composed of Drosophyllum lusitanicum distributed in Spain, Portugal, and Morocco. 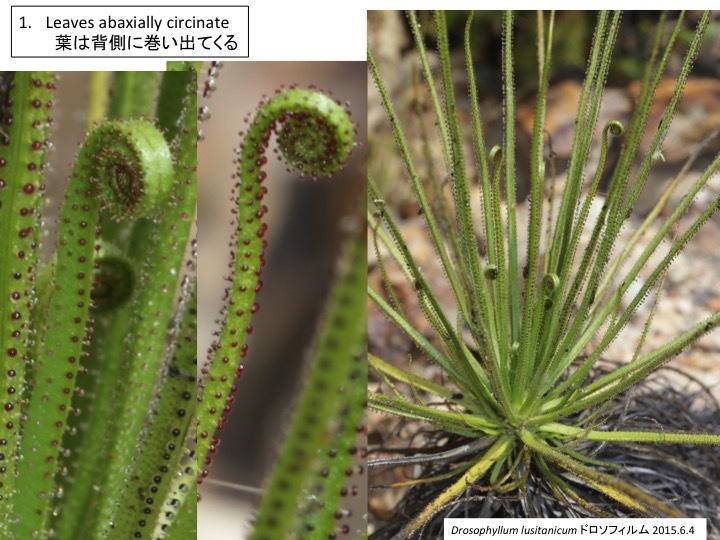 Young leaves are adaxially circinate in ferns and some flowering plants including Drosera and Dionaea, both of which are carnivorous plants in the same clade as Drosophyllum in Caryophyllales. 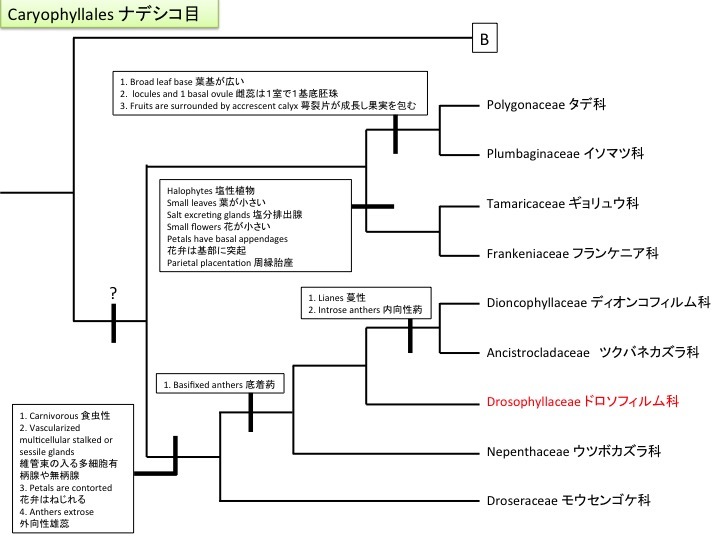 However circination of Drosophyllum lusitanicum is abaxial, which is not observed in other plants. The adaxial and abaxial orientations of a leaf appears to be the same as other plants based on the xylem and phloem orientations (Lloyd 1942 1942). 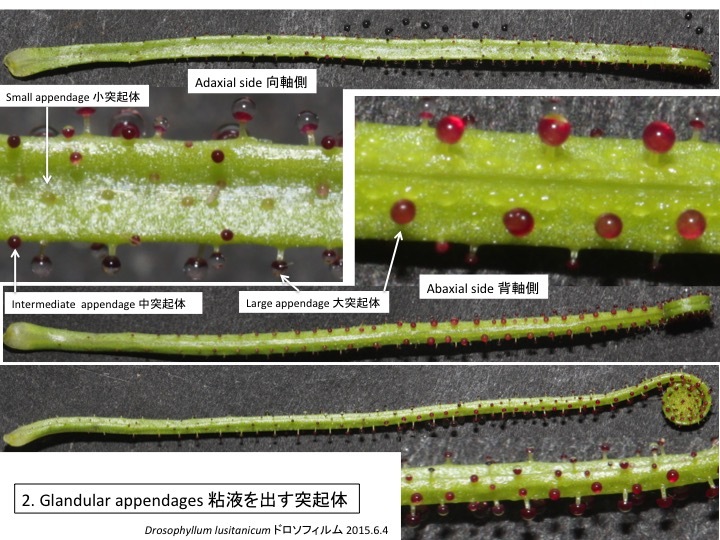 However, it will be worth to examine the expression patterns of adaxial and abaxial genes at the early leaf development, since glandular appendages are mainly formed on the abaxial side, which is opposite in Drosera, in which glandular appendages (tentacles) are formed on the adaxial side. Lloyd, F.E. 1942. The Carnivorous Plants. Chronica Botanica Co. There are three types of glandular appendages without movement ability. Large and intermediate appendages have vessels, tracheids, and sieve tubes but small appendages do not (Green et al. 1979). 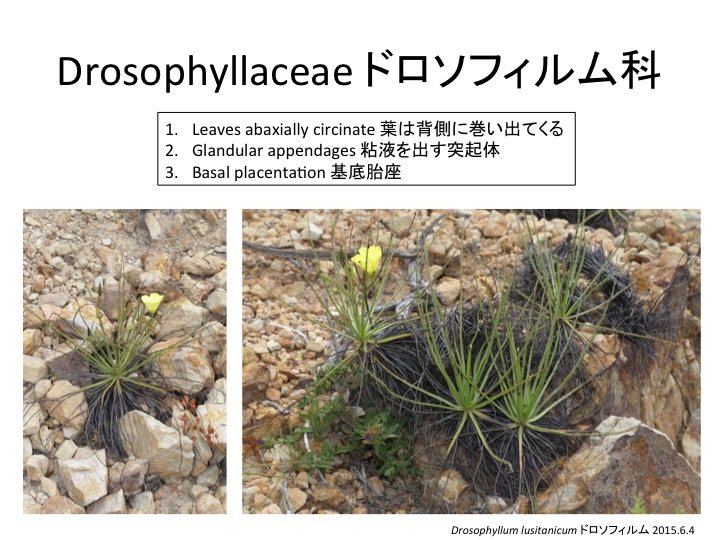 Glandular appendages of Drosera also form vessels but homology between appendages of the two genera is unknown. Green, S., Green, T.L., and Heslop-Harrison, Y. 1979. 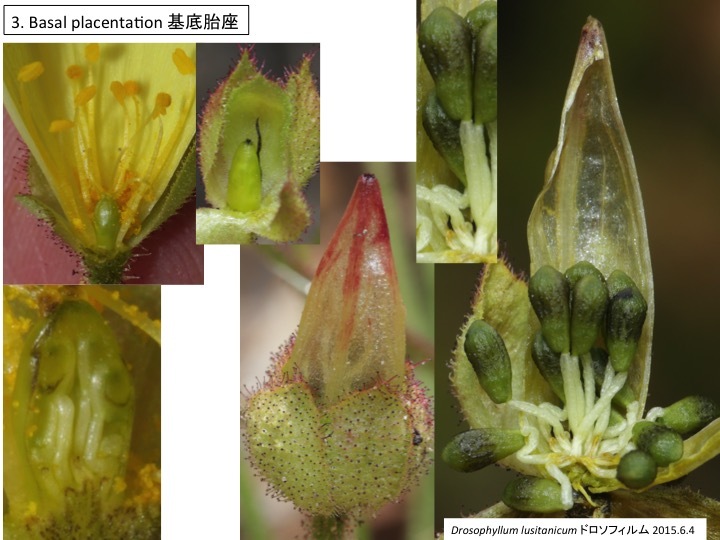 Seasonal heterophylly and leaf gland features in Triphyophyllum (Dioncophyllaceae) a new carnivorous plant genus. Bot J Linn Soc. 78, 99-116.